Bella's Beauty Spot: LUSH Limited Edition Perfumes- Available today only! 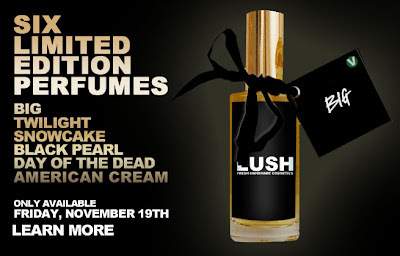 LUSH Limited Edition Perfumes- Available today only! Today only, LUSH will be offering their limited edition perfumes for the price of $29.95 I just talked to LUSH's PR person, who told me the delivery date for these is uncertain, however the date will be before Christmas. •American Cream – Lavender and vanilla shake with a hint of fresh fruitiness. •Snowcake – Almond marzipan and rose absolute for sophisticated sweetness. •Twilight – Find serenity in lavender and tonka absolute. •Big – Tropical mandarin and vanilla perfume for breezy, beachy days. •Black Pearl – Sail the high seas of lavender and blackcurrant. •Day of the Dead – Zesty lime fragrance inspired by a Mexican fiesta for the dead. Check out LUSHUSA for more info.